It's the week that requires no introduction! Photo by Jeff McCoy. For the first time in... well..., maybe in forever, Liberty Bell may not be the biggest invitational meet of the its weekend here in Colorado. 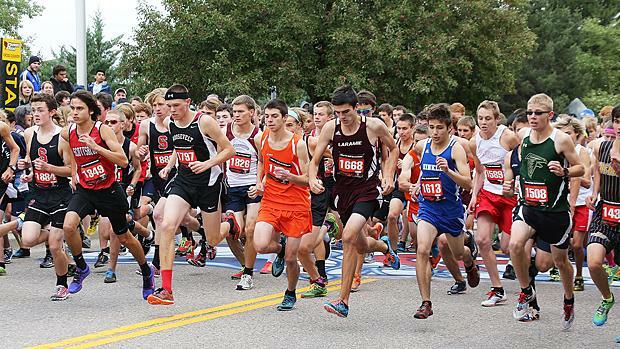 Going head-to-head with Liberty Bell on the same weekend this year is the St. Vrain Invitational. Between them, they pretty much have the weekend locked up. At least on the Front Range. Aside from Lyons and Heritage, no other school on the Front Range is hosting a meet this weekend. Or, if they are, they aren't advertising it. Hotchkiss and Durango divvy up that part of the Western Slope crowd that isn't pointing a bus toward Lyons or Littleton. So, is the showdown mentioned in the title of this article the one in Littleton, the one in Lyons, or the one between the two meets? I'll leave that one for the reader to answer. But, be assured that the showing down will be serious this weekend. Before the weekend rolls into place, however, St. Mary's Academy and Standley Lake will be hosting meets of their own. St. Mary's sets up shop at Denver's Bible Park. At this point, it's looking to be on the smallish side of meets, but I've been known to be wrong about that kind of assessment before. Standley Lake, on the other hand, looks to be attracting a fairly large collection of teams to its meet at Stony Creek Golf Course. Then, of course, all fury breaks loose on Friday afternoon. There just might be enough feet there to wear grooves in the asphalt, but the packed surface of the Highline Canal is probably impervious to any disturbance. This one is well-known as flat, fast, and little downhill. Some teams and athletes swear by this event, and some teams and athletes scoff at the "mythical" PRs. Which one you are probably reveals a lot about which meet you're attending this weekend. The fury will not be exhausted on Friday afternoon. Come Saturday morning, it simply moves a few miles north to the course at St. Vrain. If you have a drone with enough battery life and low-light video capability, you can probably create a small internet sensation by following the northward drift of the fury under cloak of darkness. The Lyons course is more or less the anti-Liberty Bell. While Liberty Bell is hard, flat, and a single circuit, Lyons is soft, sloping, and a criterium-style course. Where Liberty Bell checks in as a net downhill, Lyons checks in as a net uphill. At Liberty Bell, you must cooperate with the course. At Lyons, you must subdue the course. That's not to say nobody runs fast at Lyons. They do, in fact. Paul Roberts and Cerake Geberkidane have both clocked 15:15 on this course. But, Lyons is a very different course nonetheless. There are a few schools pointed at both meets, but I'm hoping there aren't any athletes planning to double up Liberty Bell and St. Vrain. I'm inclined to think that won't go so well on Saturday morning. Among the headliner teams loading the bus for Liberty Bell are Cheyenne Mountain, Arapahoe, Broomfield, Cherry Creek, Fort Collins, and Albuquerque Academy. Among those headliner teams loading the bus for St. Vrain are Mountain Vista, Palmer Ridge, Air Academy, Lamar, Salida, Telluride, Peak to Peak, and Rampart. Colorado Track XC will be on-hand for both meets, bring you coverage of the pageantry, the emotions, and the triumphs. But, hopefully, you'll be attending at least one of the two meets to see it all for yourself on a first-hand basis. For those who somehow missed the opportunity to get in at Liberty Bell or St. Vrain, well, there's the Denver North Viking Invitational on Monday. That one, too, has become something of a big deal meet, and the closest thing to a relief valve that this weekend has. If you're on the Western Slope, and a long bus ride to the Front Range just doesn't seem all that attractive, the dobies of Hotchkiss and the grassy expanses of Hillcrest Golf Course in Durango provide a similar set of contrasting options west of the Continental Divide. The Durango meet begins at 6 PM and finishes under the lights. The Hotchkiss meet starts and finishes under the big light. First starting gun at 9 AM.